A team led by Lida Kanari now reports a new system for distinguishing cell types in the brain, an algorithmic classification method that the researchers say will benefit the entire field of neuroscience. Blue Brain founder Professor Henry Markram says, "For nearly 100 years, scientists have been trying to name cells. They have been describing them in the same way that Darwin described animals and trees. 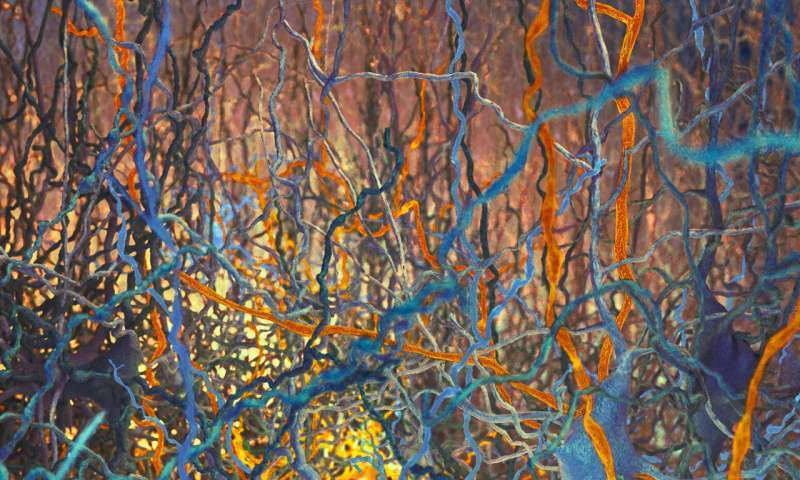 Now, the Blue Brain Project has developed a mathematical algorithm to objectively classify the shapes of the neurons in the brain. This will allow the development of a standardized taxonomy [classification of cells into distinct groups] of all cells in the brain, which will help researchers compare their data in a more reliable manner." The team developed an algorithm to distinguish the shapes of the most common type of neuron in the neocortex, the pyramidal cells. Pyramidal cells are distinctively tree-like cells that make up 80 percent of the neurons in the neocortex, and like antennas, collect information from other neurons in the brain. Basically, they are the redwoods of the brain forest. They are excitatory, sending waves of electrical activity through the network, as people perceive, act, and feel. The father of modern neuroscience, Ramón y Cajal, first drew pyramidal cells over 100 years ago, observing them under a microscope. Yet up until now, scientists have not reached a consensus on the types of pyramidal neurons. Anatomists have been assigning names and debating the different types for the past century, while neuroscience has been unable to tell for sure which types of neurons are subjectively characterized. Even for visibly distinguishable neurons, there is no common ground to consistently define morphological types. The study from Blue Brain proves for the first time that objective classification of these pyramidal cells is possible by applying tools from algebraic topology, a branch of mathematics that studies the shape, connectivity and the emergence of global structure from local constraints. Blue Brain has pioneered the use of algebraic topology to tackle a wide range of neuroscience problems, and with this study, has once again demonstrated its effectiveness. In collaboration with Professors Kathryn Hess at EPFL and Ran Levi from the University of Aberdeen, Blue Brain developed an algorithm for objectively classifying 17 types of pyramidal cells in the rat somatosensory cortex. The topological classification does not require expert input, and is proven to be robust. The structure of most neurons resembles a complex tree, with multiple branches connecting to other neurons and communicating via electrical signals. If we keep the longest (persistent) components of the neuron structure and decompose the smaller branches, we can transform its tree-like structure into a barcode—a mathematical object that can be used as input for any machine-learning algorithm that will classify the neurons into distinct groups. Any neuron classification process confronts a question: Are two cells that look different just part of a continuum of gradually changing differences (like different breeds of dogs) or are they really different "species" of neurons? In other words, are they discrete or continuous morphological variations of each other? This can be answered by using the new topological classification and grouping the different "species" of brain cells, each with its own characteristic "breeds."